Q: Your recent discussion of “forked tongue” prompts this question. The far eastern end of Long Island splits into the North Fork and South Fork, but shouldn’t that really be North Tine and South Tine? This all began back in Anglo-Saxon times, when forca, the Old English spelling of the noun “fork,” was borrowed from furca, Latin for a two-pronged tool like a hay-fork or yoke. The English word originally meant “an implement, chiefly agricultural, consisting of a long straight handle, furnished at the end with two or more prongs or tines, and used for carrying, digging, lifting, or throwing,” according to the Oxford English Dictionary. “Ða cwelleras … wið-ufan mid heora forcum hine ðydon.” (“The executioners … pierced him from above with their forks”). The passage, using the plural forcum, describes the death of St. Lawrence. The original “pitchfork” (pic-forcken in early Middle English) appeared in Layamon’s Brut, a poem written sometime before 1200, according to the Middle English Dictionary, published by the University of Michigan. Later, the OED says, “fork” was used for an object “having two (or more) branches,” such as a “stake, staff, or stick with a forked end.” These forks were for propping up a vine or tree (a use first recorded in 1389), or for resting a musket (1591) or a fishing rod (1726). Interestingly, “fork” didn’t come to the table until four and a half centuries after its first appearance in English. The OED’s earliest mention is from a will recorded in 1463: “I beqwethe to Davn John Kertelynge my silvir forke for grene gyngour” (“I bequeath to Davin John Kerteling my silver fork for green ginger”). The document was first published in 1850 in Wills and Inventories From the Registers of the Commissary of Bury St. Edmunds, edited by Samuel Tymms. 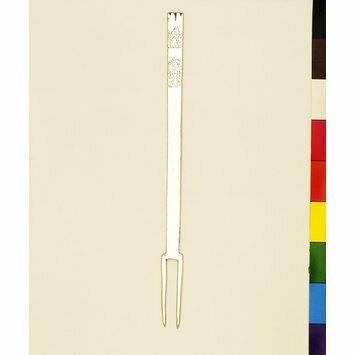 Early table forks, according to historians, generally had two prongs, as with this 17th-century English fork from the collection of the Victoria and Albert Museum. Even into the 19th century, illustrations of table scenes showed people eating with two-pronged forks, as in this 1830s print from the British Museum. So it’s not surprising that a “fork” in its geographical sense meant something that split into two parts. The OED doesn’t discuss the use of “fork” in reference to land bodies that divide (like Long Island, which splits into two peninsulas at Riverhead, NY). This kind of “fork” originally meant the point where a river divides in two or where two rivers join, a sense first recorded in the late 17th century. In subsequent OED citations, “fork” is used both for the division and for each branch of a waterway: “the forke of the brooke” (circa 1700); “the big fork of said river” (1753); “the fork of the Nebraska” (now the Platte River, 1837); “the north and south forks” (1839); “the east fork of the Salmon River” (1877). By the mid-19th century, these same usages were being applied to roads—the place where a roadway splits as well as each route taken. Washington Irving, the OED says, was the first to use the phrase “a fork in the road,” in his Chronicles of Wolfert’s Roost (1855). “Here take the right hand fork” (from The Roads of England and Wales, 1883; the phrases “left hand fork” and “right hand fork” appear a dozen or more times in the book). Although “fork” is now the usual term for each branch when a road, a waterway, or an island splits, the word “tine” does occasionally show up.